It is often tempting to skip breakfast when following a low-calorie diet, or when simply rushed in the morning, but why not kick start your day with any of these versatile and deliciously healthy breakfast diets. Eating a healthful breakfast boosts a sluggish metabolism after the body's nightly fast taking place between dinner and waking, thus jump starting the amount of calories your body burns throughout the day. Eating a nutritious breakfast has more benefits than you may think, from controlling weight and cholesterol levels to benefiting your overall life expectancy. Preparing a nutritious breakfast each morning need not be as time consuming, tedious or complex as you might think. Healthy breakfast diets focus on food groups, which are low in fat, sugar and calories, but are high in nutrients, vitamins and minerals, which give sustained energy during the day while also leaving you feeling full for longer. Eating a simple but healthful breakfast in the morning also assists in curbing impulse eating throughout the rest of the day. A healthy breakfast diet includes a combination of complex carbohydrates, fiber, low-fat proteins and a moderate amount of fat, or it will focus on one or two of the core essentials for health depending on the particular diets' guidelines. Fresh fruit and vegetables are high in nutrients and low in calories. You can mix with yogurt or high fiber cereals, or you can juice fresh fruit and vegetables into a quick to-go beverage or healthy smoothie. Choosing low fat proteins for breakfast will leave you feeling full for longer, while also giving you plenty of energy. Good low fat protein choices include protein shakes, hard-boiled eggs and lean portions of fish and poultry. In moderation, low fat dairy products are a healthy choice for breakfast, serving as an excellent source of combined proteins as well. Choose low fat options such as skim milk, yogurt and natural low-fat cheeses like cottage cheese. Complex carbohydrates are nature's fuel for the human body, providing a slow release of sustainable energy throughout the day. Not only are complex carbs an excellent source of energy throughout the day, but they are naturally high in healthy fiber. Include whole grains in your breakfast with whole grain cereals, breads and breakfast muffins. Complex carb diets focus on breakfast meals high in fiber or whole grains. Fruits, whole grains and vegetables all are excellent sources of fiber. 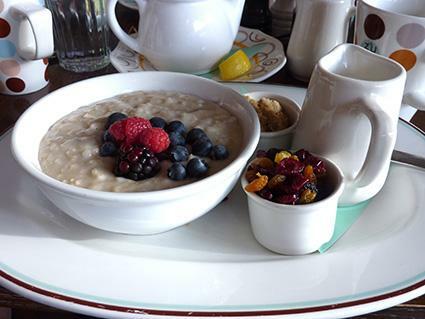 A typical complex carb breakfast could include hot oatmeal served with fresh berries or fruit. Other ways to get your daily fiber and whole grains are by eating fiber shakes, whole grain toast or mixing flax seed into your yogurt. Many popular diets, such as The Zone Diet, emphasize complex carbs combined with protein for breakfast. A healthy high protein breakfast is often associated with one of the low carb diets, such as The Zone Diet, or The South Beach Diet. Other protein breakfast plans include the traditional English breakfast, or the Big Breakfast Diet - a whopping 600 calorie breakfast combining proteins and carbohydrates. If you love your bacon and eggs, these breakfast diets are the way to go. Moreover, if you are watching your fat intake, try substituting traditional bacon with turkey bacon. Another low-calorie protein breakfast alternative consists of easily-assimilated protein shakes. The fruit based breakfast is often associated with the raw food diet programs, but is also known in the circle of vegetarian and food combining diets, such as the Hay Diet. Eating alkaline based foods in the morning, such as citrus foods and fresh green vegetable juices supplies a bounty of energy and nutrients, yet does not create the sluggish feelings often associated with a traditional protein bacon and egg breakfast. If you are not an early riser, or a breakfast person by nature, oftentimes the liquid breakfast diets are the easiest way to assimilate yourself into a regular breakfast routine. Juicing fresh live fruits and vegetables is efficient, and if you do not have the time to juice from scratch many options for ready-to-go fruit and green juices are available - just mix and stir with water or your favorite juice. Alternatively, high fiber and protein mix are sold almost everywhere these days, allowing you to supplement your fiber or protein needs for the day, as well as making delicious smoothies with fruit, milk or yogurt.